Reader Appreciation: You Are One. You are one, trust me. But you’re among friends. Welcome, and please come back again. Nerd. If I had a TARDIS, I’d go back and make myself ask you to dinner. Temporal paradoxes be damned. 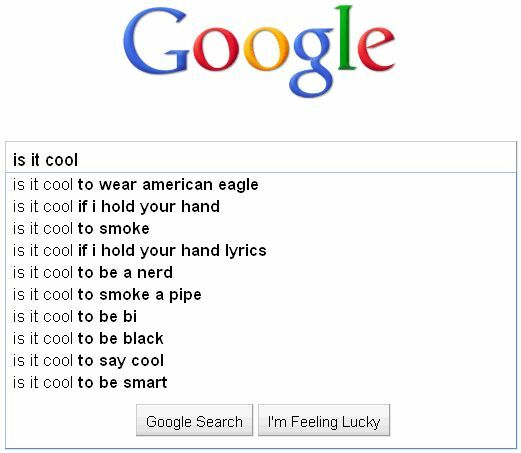 Google Game: Is it cool? I think it’s safe to say: If you have to ask, the answer is no. 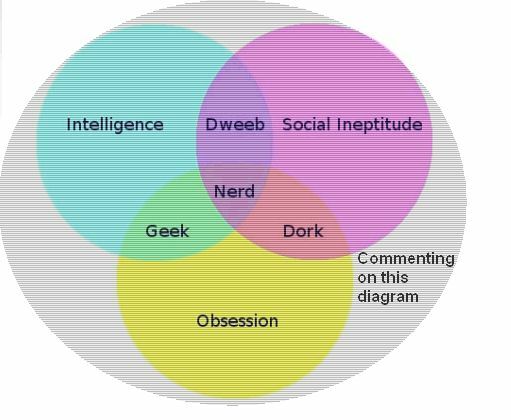 Annals of Uncool: Where Do You Fit in? 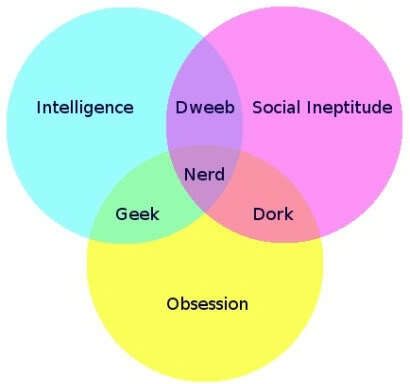 If you’ ve wondered where on the (un)social scale you lay, I hope this Venn diagram will help you sort out your approximate geek/nerd/dork/dweeb quotient. In November 2009, Time Warner Cable launched Connect a Million Minds (CAMM), a philanthropic commitment of $100 million cash and in-kind donations. This five-year program was designed to inspire students to pursue learning opportunities and careers in science, technology, engineering and math (STEM). What do I see in the future? Well, I do hope that the US ups its STEM game in the global marketplace. But it’s disheartening to think that our bosses will have been encouraged in adolescence to nurture the chips that being a geek in high school piles on their shoulders. Still, here’s hoping the nerds of today in fact become the innovators of tomorrow. Back up plan: train all these kids to put customers on hold for an hour. If you laugh at any of these jokes, performed by “science comedian” Brian Malow, you are officially a nerd. Welcome. Bonus: if you watch/enjoy the additional video on his website, like I did, you’re super geeky. About two-thirds of the way through it he wonders, “Why is it that if you like science you’re labeled a geek or a brain? Has that ever struck anyone as unfair? Is it any less geeky to have vast knowledge of sports trivia and statistics?” Yes. Much less.